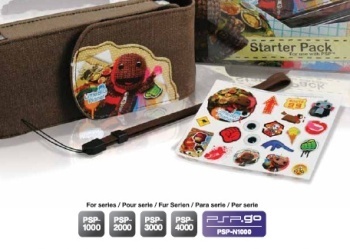 The long-rumored next iteration of the PSP appears to be one step closer to reality as an ad for a LittleBigPlanet case indicates that it's suitable for all models of the unit, including the PSP-4000. Rumors of a new UMD-based PlayStation Portable model have been kicking around since late 2008, when anonymous sources claimed that an updated PSP would hit the market by the end of this year. In August of this year, Engadget added fuel to the fire by saying that a "reliable tipster" who had previously made an accurate call on the PS3 Slim had dropped the dime on the PSP-4000, which would retain the UMD drive and share shelf space with the PSPgo. Yet more evidence of an imminent announcement has now turned up in an advertisement for PSP accessories from Accessories 4 Technology, which claims that the items in question are suitable for the PSP 1000, 2000, 3000 and 4000. The ad appears on page 16 of the digital edition of MCV UK and remains in place at the time of writing. Furthermore, as The Lost Gamer notes, "Accessories4Gamers have made products for previous iterations of the Playstation Portable, as well as the most recent 'Go' model, so surely this isn't a typical print error." Sony hasn't said a word on the matter so at this point it's still just a rumor, albeit a very strong one. With the cat all but out of the bag, however, it's probably safe to assume that something official will be forthcoming soon.